Swim Manager Jessica Mitchell provides expert instruction for learning or improving your breaststroke. Each of these stages can't be performed effectively without first perfecting the previous stage. I'm going to tell you how to get each of these stages right with the breaststroke. 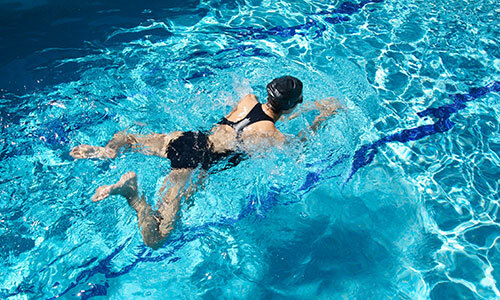 Your body position should be as flat and horizontal in the water as possible with your shoulders and hips all inline. In the breaststroke you will be on your front and your head will be tilted slightly back to allow you to breathe, so your legs will drop more than in frontcrawl or backstroke, but try to maintain as flat a position as possible to keep yourself streamline. Start with your legs straight and then pull them up towards your bum, bringing the heels together. Your legs should now be bent. Next, flex your feet backwards and push out in a circular motion , then snap your legs back together so that they're straight again. Your feet will be pointing at full extension. As you pull your arms round, your feet should be lifted up to your bum. As you kick out, extend your arms. Your arms will provide most of the propulsion in your stroke, so it's important to get it right. 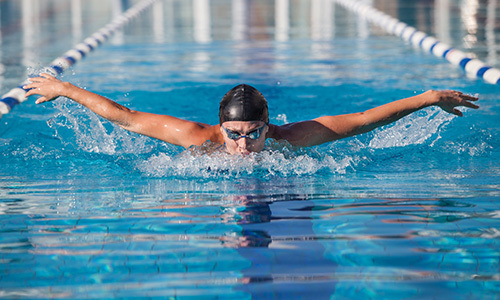 The arm action for breaststroke uses both arms at the same time. You'll begin with your arms fully extended, palms down in the water. As you scoop your arms outwards, keep your elbows high, which will help you to maintain a paddle formation. 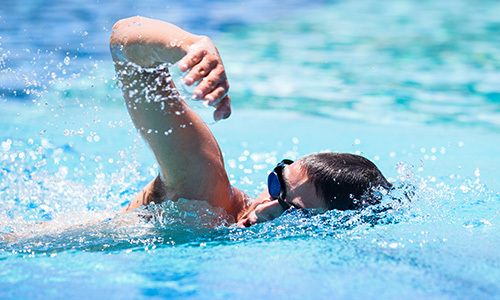 Once your hands reach your hips bring them back in pulling your elbows tight to your body and push through the water with your finger tips, returning to the starting position. Now that you have got the stroke developed you can move on to the breathing. This tends to be the part of the stroke where most people struggle. For breaststroke you should try to take your breath by lifting you head up and looking forward as you're pulling your arms back. 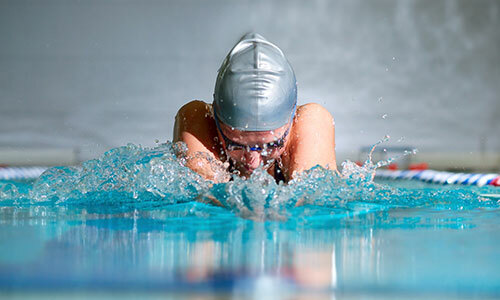 You only need to raise your head up to the point your chin is out of the water, too low and you will not be able to take the breath, too high and the resistance against your body will slow your stroke. Put your head back down as your arms are fully extended in front of you and exhale. Never attempt a swimming stroke for the first time on your own. 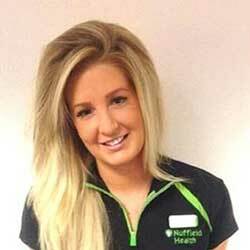 Expert instruction is available at all Nuffield Health swimming pools. Swim Manager Jessica Mitchell provides expert instruction for learning or improving your front crawl stroke. Swimming Coordinator Mathew Carter provides expert instruction for learning or improving your butterfly stroke.